This mod is completly save. If u deactive the mod, u will have your normal max stats back. Playing with the mod or disabling it will not destroy your savegame. Hope that thought didn't scare you off in the first place. - Spanish translation uploaded, created by @jaimedpb, thanks! - French translation uploaded, created by @kiopho, thanks mate! Update to V1.8 - Last legendary potion and Demonic Protection (invulnerabilitypotion) added, check it out. 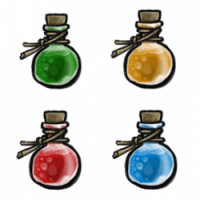 Update to V1.7 - Legendary potions (2) added, check it out. More coming soon! Update to V1.6 - Important bugfix regarding large potions! Update to V1.5 - Large potions added, check it out. Update to V1.4 - Update to improve compability with other mods. Update to V1.3 - Small tinned Sunray (lightpotion) added, check it out. Update to V1.2 - Another bugfix! Update to V1.1 - Small Rupture of Time (timepotion) added, check it out. So... mention a game with a.... alchemy station and no potions at all... ohwait! I just didnt want to wait any longer, so i created some potions already. doesn't matter what kind of weapon u are using or even fists. - Accelerates (x4) the time for a while (180s). - Player starts glowing and is able to see in the dark for a while (60s/120s). - Increases the player's health permanently (+20). - Increases the player's sanity permanently (+25). - Increases the player's damage permanently (+3). - Provides invulnerability in cost of sanity (-40) for a short time (8s). small ones require science lv 1 and 2, large/legendary ones require lv 3. All potions can be crafted with common/rare ingredients. I need 1. more ideas and 2. maybe a little bit help if it gets complicated. Take a look and leave your thoughts. Is this nighmare version compatible? Does not work. The game hangs.